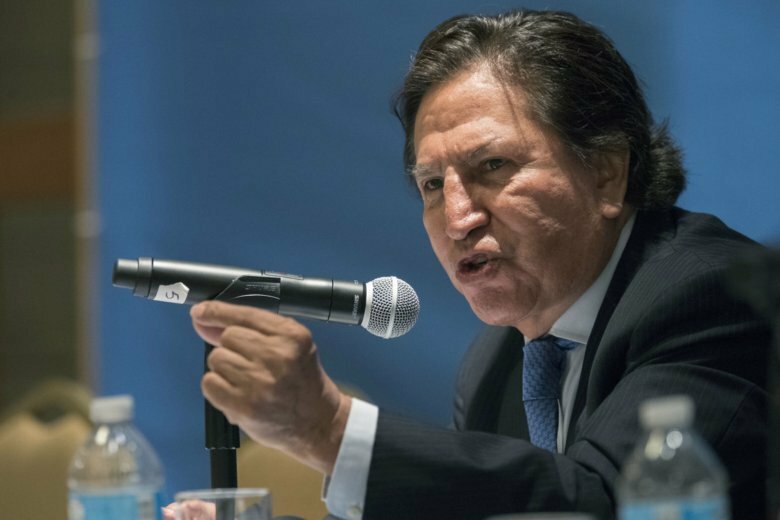 SAN FRANCISCO (AP) — Former Peruvian President Alejandro Toledo, wanted in his home country in connection with Latin America’s biggest graft scandal, was arrested in California on suspicion of public intoxication and spent the night in jail before being released Monday, authorities said. Toledo is accused of taking $20 million in bribes while leading Peru. He has been living in the San Francisco Bay Area, and Peruvian authorities have been seeking his extradition since 2017. However, the arrest appears unlikely to hasten that process. The 72-year-old Toledo was arrested after officers were called to a restaurant in Menlo Park just south of San Francisco, said San Mateo County Sheriff’s Office spokeswoman Rosemerry Blankswade. Toledo was drunk and had refused requests to leave the establishment, she said. He was released without charges, which Blankswade said is routine for most public drunkenness arrests. Toledo was Peru’s president from 2001 to 2006 and developed a reputation for partying. His presidential aircraft became known as the “party plane” after a government official was caught on camera drunkenly singing a popular tune called “Pass Me the Bottle” while aboard a flight to Europe. Toledo has denied reports about drinking. After Toledo left power, incoming President Alan Garcia published a tally of Toledo’s liquor purchases during his time in the presidential palace: $164,000 in spirits, whisky, wine, beer and other alcoholic beverages. Peruvian prosecutors accuse Toledo of taking $20 million in bribes from Brazilian construction firm Odebrecht while president. He has denied wrongdoing. In February 2017, then-President Pedro Pablo Kuczynski asked President Donald Trump to deport the ex-Peruvian president. Blankswade said the international police organization Interpol issued a “warning” to law enforcement agencies around the world to notify it when Toledo was arrested. Interpol officials told the San Mateo County sheriff’s office they had no immediate plans to take Toledo into custody. “After reaching out to Peruvian officials and Interpol, we learned that the existence of charges in Peru alone does not authorize the subject’s arrest in the United States,” Blankswade said. Toledo brushed off questions about his arrest on suspicion of public drunkenness during a brief radio interview Monday with Peru’s RPP radio. “I’m at my home, writing my book,” he said when a reporter reached him on the phone. Interpol officials did not immediately return phone messages left with the organization’s U.S. office in Washington. Odebrecht in 2016 acknowledged in a plea agreement with the U.S. Justice Department to paying some $800 million in bribes to politicians throughout Latin America. The scandal has hit a particularly rough note in Peru, where nearly every living president is suspected or under investigation for ties to Odebrecht. All of Peru’s former presidents have denied wrongdoing. Toledo moved to Northern California shortly after leaving office to work and study at Stanford University in Palo Alto, according to a 2007 San Francisco Chronicle report. Toledo earned a doctoral degree in education and two master’s degrees from Stanford, where he delivered the commencement speech to the school’s graduating class of 2003 while still in office. He has held a variety of fellowships and visiting scholar positions at Stanford until 2017, according to university announcements. In 2017, the same year Peruvian officials announced they were seeking to arrest Toledo, Stanford spokeswoman Brooke Donald told a Latin American media outlet that the college was severing its ties with Toledo, who she said was an unpaid “volunteer” who didn’t teach. Stanford officials didn’t respond to email and phone inquiries Monday. The public drunkenness arrest marks the latest chapter in what has been a stunning fall from grace for the man who rose out of poverty to become Peru’s first president with indigenous roots. Toledo grew up shining shoes and selling lottery tickets in northern Peru, one of 16 children, at least seven of which did not survive to adulthood. A happenstance meeting with a U.S. humanitarian worker couple set his life on an unexpected trajectory: With their help, he applied and won a scholarship to the University of San Francisco. His jovial nature, ease with the masses and opposition to strongman Alberto Fujimori helped him clinch the presidency in 2001. He proudly called himself “El Cholo” — a term referring to his indigenous ancestry. The nation’s economy boomed under his leadership, with gross domestic product rising from 0.2 percent to 6.8 percent. Armario reported from Bogota, Colombia. Franklin Briceno in Lima, Peru contributed to this report.